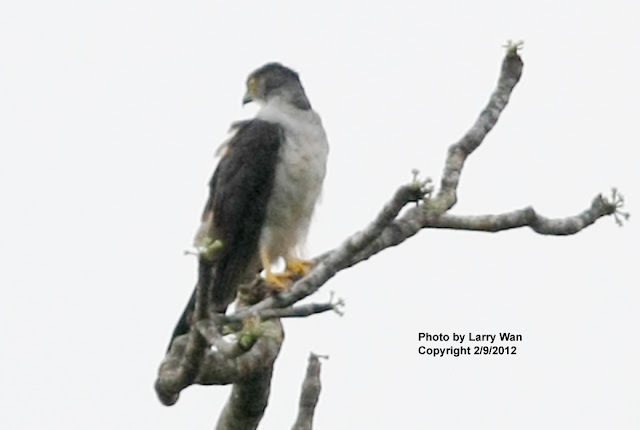 On February 9th of 2012, at 7:17 AM while guiding a birding program for Sendero Panama, we spotted a raptor on top of a Cuipo tree near the road in the way to El Salto, Darien. The bird was very similar to a Bicolored Hawk but inmediatly I noticed the paler gray on the belly and the lack of rufous on the thighs. 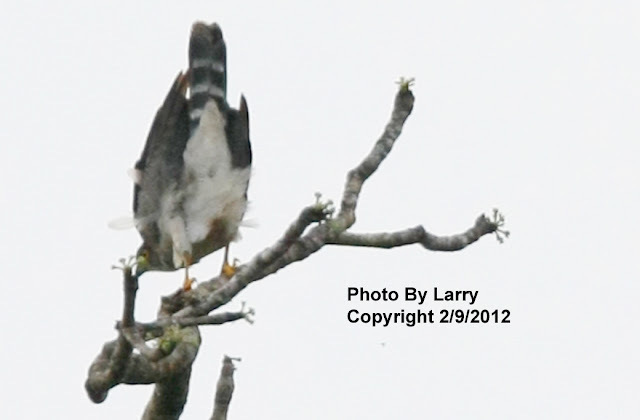 Immediately our guest, Larry Wan took his 500mm camera and made several pictures of the bird which are the ones posted here. 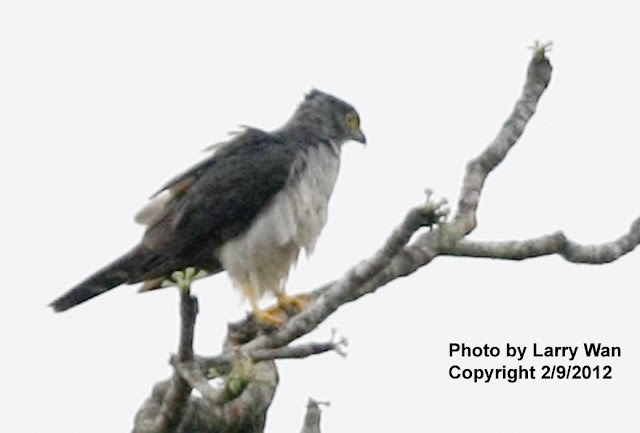 I also remembered a 2008 report of an immature Gray-bellied Hawk in Costa Rica and started pointing at the differences between both hawks. 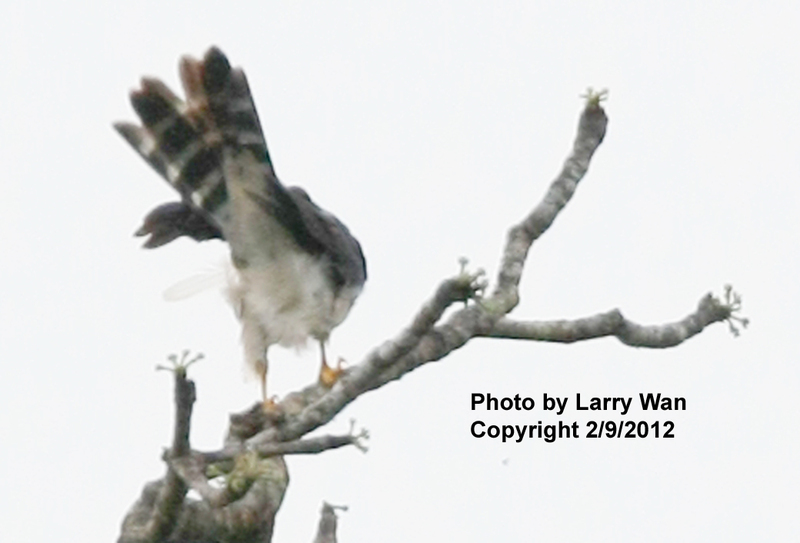 The lack of rufous on the thighs, the paller grey in the chest and belly, the contrast between black crown and dark cheeks were the immediate marks we noticed. While Larry and Sara were making pictures and observing the bird, I got to hear the bird call: 6 or maybe 7 notes, high pitch, 1 1/2 seconds apart from the other. I have heard and seen several times Bicolored Hawk in Bocas del Toro and this bird was lighter in color and called very different. 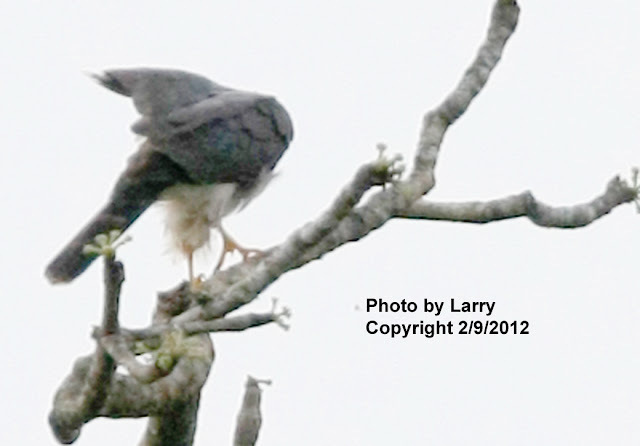 Sara Wan, Larry Wan and Christian Gernez were present during this sighting. The morning was hazy and not to bright. The present picture were made by Mr. Larry Wan with a 500mm Canon camera at about 250 to 300 mts.